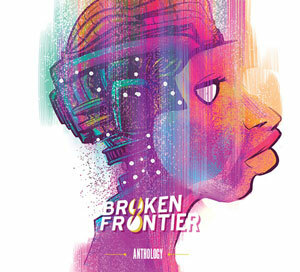 BROKEN FRONTIER AWARDS – BEST WRITER AWARD WINNER AND BEST GRAPHIC NOVEL AWARD NOMINEE! When 2017 Broken Frontier Award-winning creator Hannah Berry announced last year in an interview with our friends over at Ink Magazine that Livestock would be her final graphic novel it was a statement that was met with genuine sadness. 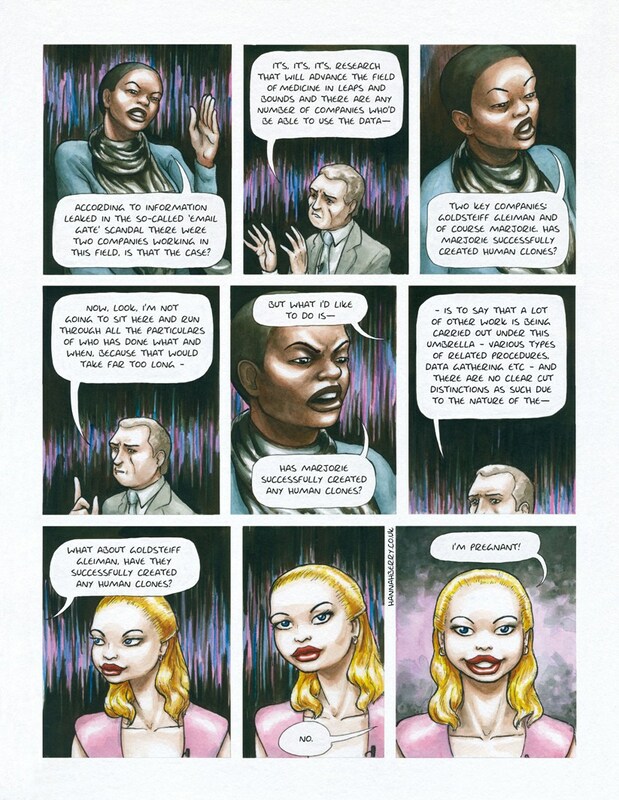 It wasn’t merely that an accomplished graphic storyteller was dropping out of long-form comics; it was that Berry’s exploitation of the form’s unique properties to accentuate the genre sensibilities of her first two books was so intuitive in presentation that this instantly felt like the acutest of losses. Her first graphic novel Britten & Brülightly defined a whole new comics sub-genre of absurdist noir while her controlled toying with the claustrophobic confines of the structure of the comics page in contemporary horror story Adamtine made that second offering a chillingly memorable affair. 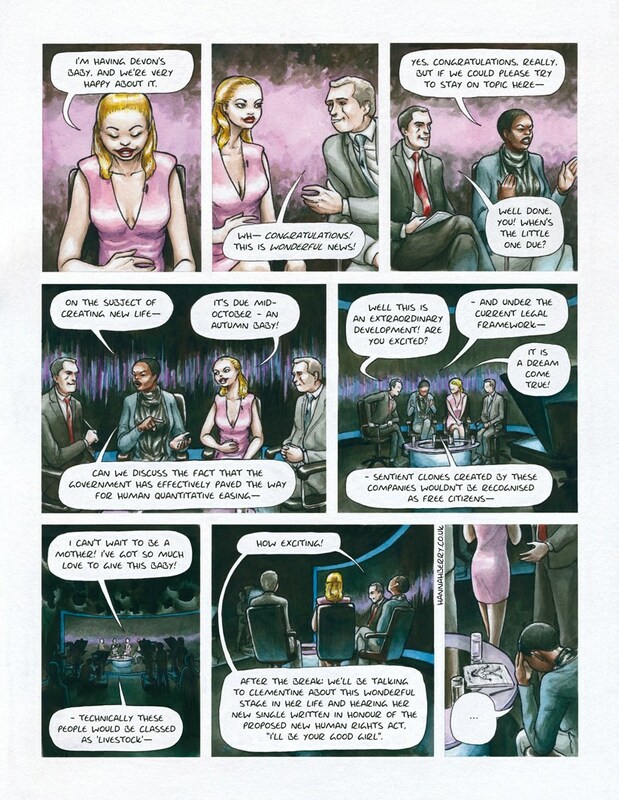 So here we are with Livestock and Berry’s self-proclaimed final graphic novel – a biting political satire on not just media manipulation of our perceptions but also of the way the media itself in turn is used as a tool by vested interests. It’s the very near future and the annual Twammies Awards are imminent. Full-on political outrage should also be the order of the day with an ongoing leaked e-mail scandal, the revelation that an act of parliament has allowed for years of secret human cloning, and the associated exposure of corporate involvement in those developments. Livestock is the graphic novel we all wish we didn’t need in this post-Trump, Brexit-looming era of social illiteracy. An uncompromising window into a world where spin doctor-style governmental gurus not so much simply control public opinion as deflect its attentions away from the important, embarrassing and damaging (to their interests) issues of the day. Instead they create faux narratives around carefully constructed public personalities to distract and connive, ensuring the populace remains docile and compliant, and that the socio-political and the worship of celebrity remain inextricably intertwined. Some years in the making, Livestock‘s premise originated long before Donald Trump’s deeply disturbing rise to power and yet rather than undermine its potency those developments have, instead, underlined its validity all the more forcefully. It’s a frighteningly incisive book in that regard; the true horror coming from our creeping realisation that Livestock‘s clone-based, borderline sci-fi elements are an extraneous detail, and our gradual acceptance that this supposedly dystopian fantasy is essentially the world we are living in today. 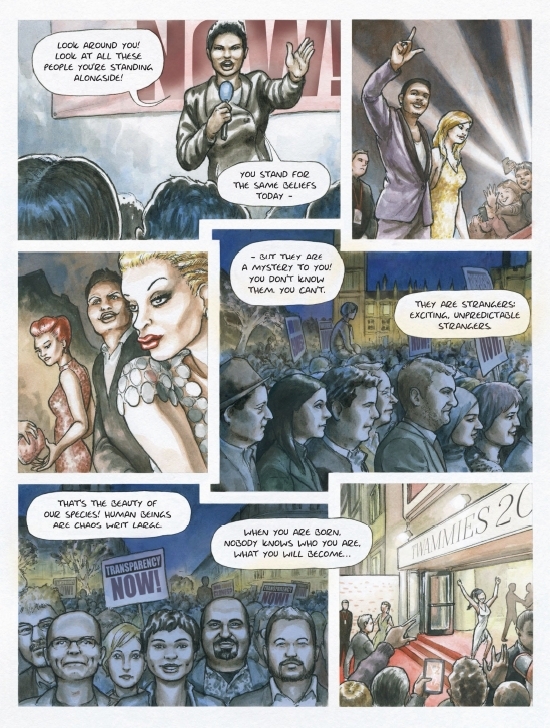 Berry’s expressive visual characterisation remains one step back from overt realism adding an extra layer to the sense of manufactured reality that the book is steeped in. 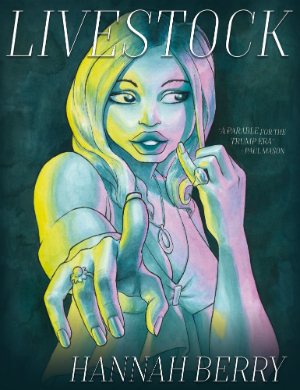 Livestock is punctuated, chapter-style, with updates on the trending issues of the day reminding us that, in a world where information is controlled and weaponised, the trivial and the ephemeral are paramount and democracy is an illusion. It’s also a damning indictment on a society that is not so much a victim of shadowy puppet masters as one that has become so complacent that it willingly embraces the role of the marionette.